Recently I started to learn how to use canvas HTML5 element and the first thing I tried to do was to draw a small rectangle. Next I wanted to an add animation loop and move that shape. After that worked, I wanted to add a bunch of them all moving in different directions and this is how my first particle system was born. This article will show you how to create one yourself. The particle system is a pretty basic one. Each particle gets a random color, random direction and random speed when they are created. After they reach the edge of the canvas, they will bounce off of it. So let’s begin. To see the end result, check the working demo at the end of the article. Note:To learn more about what else can be done with Canvas, check the following book Core HTML5 Canvas: Graphics, Animation, and Game Development (Core Series). In the first part of the book, Canvas API is covered and in the second part, it shows you how to use that API to create animation, simulation of physics, game development and more. First, let’s add the HTML and CSS file. And here is the CSS file. Both margin and padding are set to 0 to remove white space from the corners. The canvas element is set to be a block element. The reason for that is to prevent scroll bars appearing in the browser, when we later set the size of the canvas to 100% of the browser window's viewport. First, some setup is needed. The code first gets a 2d drawing context. Canvas itself is just a drawing surface without any drawing capabilities. The context is the one with methods and properties for drawing graphics. Next, the canvas size is set to be the size of browser window's viewport. All particle objects will be stored in particles array. The num_particles defines how many particles to create. In our case, that number is 1000. Next, let’s add any helper functions that the particle system might need. Each particle will get a random color. So we need a function that does that. In the next step, we will create our Particle object. First, we create a constructor for the object. Each Particle object that will be created will have a random value on each of it's properties. Position of particle in the canvas (0,0 is the top left). Velocity of the particle ranging from –2 to 2 (to be precise, Math.random will never return exactly 2 but that is not important in our case). At each frame, position x, y position is updated by vx, vy amount. Color of the particle. This is where we use the random color function from the previous step. Next, we will extend the Particle object by adding some methods to it. This one is simple, it draws the particle. Draw function renders a rectangle at its current position and fills it with a color that was randomly generated when the particle object was first created. The size of the rectangle is set to 2x2. The Update first updates the position by adding the current position with velocity (line 2, 3) and then checks if the updated position reached outside of the boundary / border of the canvas (line 5-9). x position is less than 0 or larger than canvas width. y position is less than 0 or larger than canvas height. When this happens, the code reverses the sign of velocity variable that is the cause of this boundary crossing. By inverting the sign, we create a bounce effect. Line 5 - Code detects, that the x has crossed the canvas boundary (it is less than 0). Line 6 - The vx (velocity of x) gets reversed from negative to positive. As a result, the particle will start to move to the other horizontal direction and will continue to move that way until it reaches the other end of a horizontal boundary when it will bounce again. We are almost done. In the next step, we will create an animation loop. This is the main loop of the particle system. First, the whole canvas is erased. Next we loop through every particle in the array, so that for each Particle object, Update() and Draw method is called. To make sure that the animation continues in the next frame, requestAnimationFrame() function is called with a callback function argument to the same loop() function. This tells the browser to call loop() again when the browser is ready for the next repaint. Almost done. All that is left is to create particle objects and start the animation. The for loop will create Particle objects and add them into particles array. How many depends on num_particles value set in the beginning. Then we call loop() function for the first time to kick off the animation and we are done. See the Pen Simple Particle System by HowToDevCode (@HowToDevCode) on CodePen. 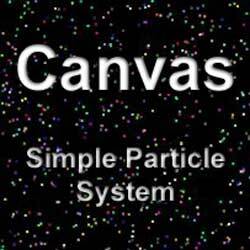 Trying to create a particle system is great way to learn about drawing multiple shapes on canvas and animate them. The particle system in this article is a simple one and can be used as a starting point for a more sophisticated version. how do you increase the size of particles?